If you need some quick, easy Valentine cards, these” fold –up into an envelope” cards are just what you want. 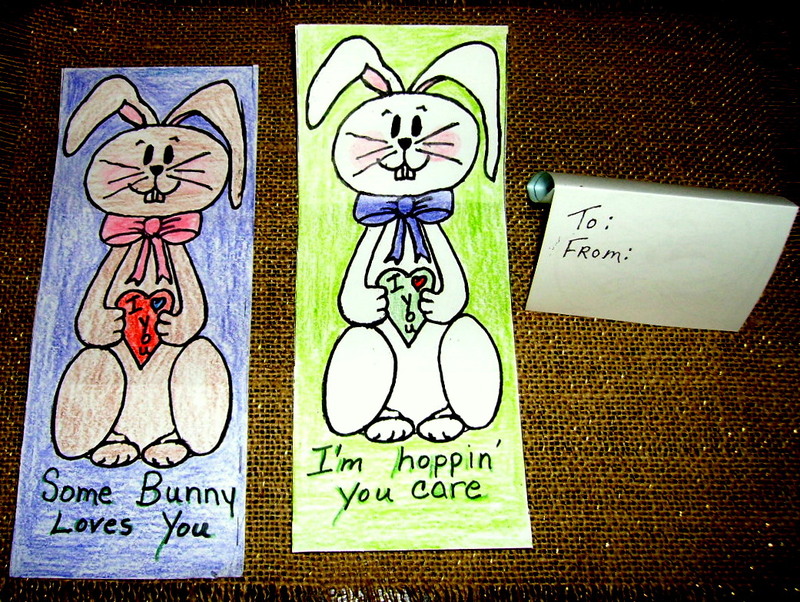 Each sheet of the pattern has three bunny cards with different sayings. Just color with colored pencils or crayons, cut and fold, and write the recipient’s name on the flap. The directions for “Bunny Valentine Card,” can be found in the Valentine’s Day Projects Gallery in the sidebar. This entry was posted in Valentine's Day and tagged bunny fold up valentine card, bunny valentine card, childrens vanlentine crafts, easy valentine crafts for children, easy valentine crafts for kids, easy valentine projects for kids, fold-up envelope, valentine card, valentine crafts for kids. Bookmark the permalink.